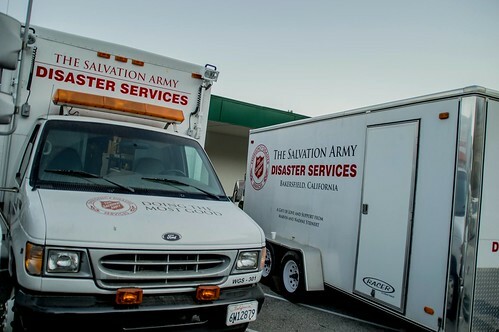 KERNVILLE, CA (July 3, 2016): Salvation Army Emergency Disaster teams continue to serve survivors of the Erskine Fire, a swift-moving blaze that began on June 23 in the Kern River Valley, destroying 285 homes and burning 48,019 acres. The Salvation Army is managing feeding operations at the designated Red Cross shelters in Kernville and Wofford Heights, providing three hearty meals per day to survivors who have lost their homes to the blaze. In addition, a Disaster Services Canteen (mobile kitchen) has visited several affected communities, providing meals, cold water and emotional support. This includes neighborhoods untouched by fire but left without power for almost a week due to the blaze. Canteen service will continue into the week, as volunteer support allows. The Salvation Army has provided 4,452 meals and 6,420 snacks to survivors of the Erskine Fire since June 23. Several local groups and businesses have donated supplies and support to the response effort, including Sikh Riders of America, The Sandu Family, McNalley’s Fairview Lodge, Kern River Brewing Company, The Ridge Project, Michalangelo’s Pizza, Panda Express, Subway, and Vons, among others. Nearly 1000 hours of volunteer support have been contributed to the effort by Salvation Army disaster response volunteers from Weldon, Tehachapi, Lake Isabella, Ridgecrest, Bakersfield, and additional communities around California. Additional volunteers from Hanford and Santa Cruz will arrive on Monday to provide relief to crews that have been serving since the fire began. To date, the shelters are scheduled to remain open until further notice, which continue to host 75+ individuals overnight and 150 survivors during each meal. An updated photo album of The Salvation Army’s Erskine Fire response can be found online: here. The Salvation Army, an evangelical part of the universal Christian church established in London in 1865, has been supporting those in need in His name without discrimination for more than 130 years in the United States. Nearly 30 million Americans receive assistance from The Salvation Army each year through the broadest array of social services that range from providing food for the hungry, relief for disaster victims, assistance for the disabled, outreach to the elderly and ill, clothing and shelter to the homeless and opportunities for underprivileged children.